This is just a jotting down of an ongoing research project into Mary McRee, landowner of the tract in which McRee City, then McRee Town, then Botanical Heights are situated. So it is very much a wandering – I hope to put everything together eventually! Mary Urquart McRee was born in Wilmington, North Carolina in 1829. I have to kick myself because I just got back from a trip to Wilmington and the outer banks of North Carolina. I’ll just have to imagine the lines that connected our journey. This article originally ran in the January 2005 issue of the Shaw Neighborhood Newsletter. Photo attributions are updated. I believe there might be an extra spark in the Shaw air to inspire people into activism. How poignant that we have a notorious example in our past – socialist activist Kate Richards O’Hare resided at 3955 Castleman from 1913 to 1917.
rtisan terms. O’Hare was a socialist and editor of the National Rip-Saw, a socialist monthly published in St. Louis. In 1910, Kate O’Hare ran for a congressional seat on the Socialist ballot, and in 1913 she represented the party at the Second International in London. In 1917, as chair of the party’s Committee on War and Militarism, she spoke coast-to-coast against U.S. entry into World War I. She was indicted under the Federal Espionage Act and imprisoned in the Missouri State Penitentiary with fellow activist Emma Goldman. In 1920, as the culmination of a nationwide campaign by socialists and civil libertarians, her sentence was commuted; she later received a full pardon from President Calvin Coolidge. O’Hare’s distress over conditions for female prisoners sparked a life-long crusade for penal reform. After leaving St. Louis, she became assistant director of the California Department of Penology where she implemented prison reform at San Quentin. Kate O’Hare was also active in Upton Sinclair’s 1934 “End Poverty in California” campaign for the governorship. Kate Richards O’Hare raised her young family in the Shaw neighborhood. She spent those years firming her ideals and beliefs and left the community stronger than when she arrived. I honor the spirit of Red Kate, who leaves a legacy to inspire subsequent generations of Shaw activists. I love this picture. There is just something about three strong Scandinavian women and their horses that appeals to me. Even more so because they are my ancestresses. Johanne Hansen Louison, born in Norway in 1859, and her two daughters, Julia and Laura. Thank you to the person who captioned this moment because it makes it so much easier to set the scene. 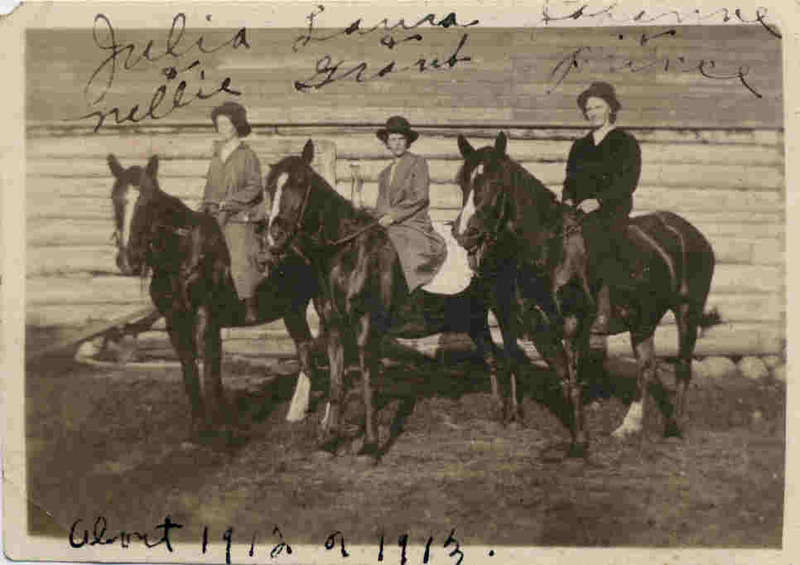 Johanne lived in Winger,MN (northwestern near North Dakota part) and in 1912 she would have been 53. She farmed the land with her husband Martin, who also immigrated from Norway. Julia and Laura would have been 16 and 17, respectively, in this picture. I wonder about the situation that made the sisters “spinsters” for many years – Julia married and had her first child at age 42, and Laura married at 33 and remained childless. This seems unusual for the time. I also love that the captionist included the names of the horses – Nellie, Grant and Prince – it seems to show an almost family-like acknowledgement. The clothing is fascinating to me as well – they are riding astride and so must be wearing split skirts or (heaven forbid) trousers. But considering their Scandinavian strength and stubbornness (I can say this because we are related) I would vote for the trousers. It was not unusual in Norway for women of that time to wear trousers while skiing. I wish the picture was in higher resolution so I could make out the structure behind them, and the tool or device in the lower left. The building looks to have a stone foundation and brickwork – houses and barns in northern MN were made of wood, so perhaps they are in town for an official event or celebration. It’s fun to speculate. Do you see any details that give more clues?